Store and protect your lens in the sturdy black Ruggard Lens Case 6 x 4.5". Featuring a thick layer of high-density foam padding and an overlapped zipper, your lens will be protected from accidental bumps, unwanted dust, and the elements when out shooting. An adjustable tension strap ensures a snug fit within the case, and your lens cap can be tucked into the interior elastic mesh pocket under the lid when not in use. To transport your gear, you can attach the lens case to your bag or belt by way of the touch-fastening belt loop, take advantage of the adjustable shoulder strap, or carry by hand with the top grab handle. Its durable water-resistant shell and ripstop nylon interior withstands constant transport and use, allowing you to worry about getting the perfect shot instead of worrying about your gear. Lens Case 6 x 4.5" (Black) is rated 4.2 out of 5 by 21. Rated 5 out of 5 by Michael from Full Protection This is a very protective case. A properly packed lens would probably survive a drop of several feet undamaged even though the clumsy photographer might suffer cardiac arrest watching the case fall. The front snugging strap is a nice extra touch that insures the lens does no slop around inside the case. The case is surprisingly light given its size. The removable shoulder strap is nice and the Velcro rear attachment strap is very good. The only possible drawback is that, due to its dense padding, the case is quite bulky. Rated 5 out of 5 by Anton from Northeast Mountain Man To be honest, I now own 5 of these cases in varying sizes, and bought this to protect my Nikon 24-70 f/2.8G (the older version).? ?These cases provide a significant amount of cushioning as well as rigid walls so I can throw the lens into a backpack and not worry about it either getting impacted or crushed.? The downside for this protection is the cases are rather bulky, but for the price point I can't complain as build quality is good and all of the Ruggard lens cases I have are holding up nicely to regular (weekend) use. Rated 5 out of 5 by Paul from Perfect fit My Tamron 24-70mm 2.8 G2 fits perfectly even with the lens hood facing forward. Well built, great protection. Rated 5 out of 5 by Nick from Rugged case This case will hold a canon 35, 85, 100 macro, or 135mm lens. Rugged padding holds a lens securely without worry. If I wanted to hold a specific lens, I would get the 6x3.5 case. You can hang it from your belt, or, over your shoulder. Rated 5 out of 5 by Todd the tenor from safe and secure I purchased this to be worry free with an expensive new Sigma ART 12-24 lens. It fits like a glove and is incredibly sturdy and can be strapped on or easily hung from the shoulder. Rated 4 out of 5 by HoustonTexan75 from Peace of Mind All around good investment and offers peace of mind. 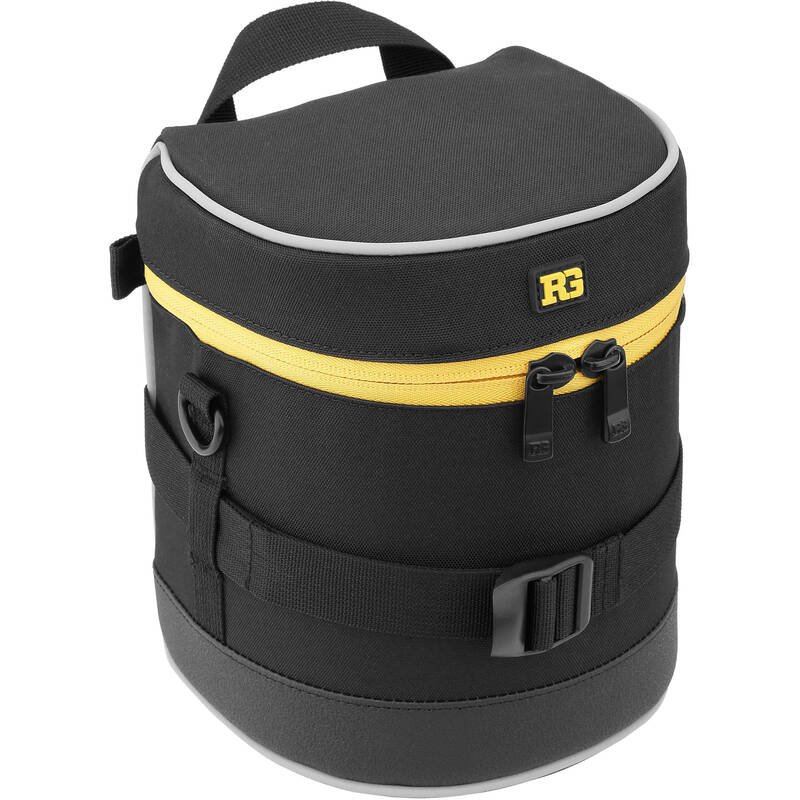 I purchased an entire set from B&H for several of my lenses, but this particular case is for my EF 24-70L II F2.8 The original cloth style lens case Canon included offers little in the way of protection. For storage, I lay the case flat side to prevent rolling or bumping up against other lenses on the shelf. For easy identification, I use a silver permanent marker to write the lens on the lid and it remains permanent (rubs off on Canon rubber L lens case bottoms). For travel, the case is padded and easily capable of protecting the lens under normal circumstances. Best of all, the outside material is durable and includes a belt attachment for wearing in the field / streets and provides fairly quick access to a spare lens. The reason I deducted one star is due to the stiff lid, which has to be almost peeled open. And, the zipper can be a little stiff when closing the lid. Not a big deal, just a little inconvenient where access is slower than it needs to be and is still painless. The upside to the stiffer lid is wearing it on your belt b/c I don't zip the lid shut and honestly think you could do handstands or cartwheels and the lens will not fall out. The case appears durable and built to last. I read other reviews complaining about the larger size, but the most important benefit is protection and I can still easily fit several of these in a large camera travel backpack. There is no such thing as the perfect product. To make this the ideal lens case, I would like to see a hard plastic liner in between the outside material / padding for extra crush protection in places like an overhead bin, plus an easier to open lid with a secondary velco top strap for faster lens access on your belt. Which Ruggard Lens case is the right size for a Canon 24-70? My 24-70 is in this one right now. So yes, it fits perfectly. Hello...will this be capable of holding a TS-E 24 mm ii lens? Are there other options like Lenscoat lens pouch that can fit this lens? I have the large model ( for the 600mm lens). It is very good. Great protection and easy to carry. Would a Tamron SP 15-30mm f/2.8 Di VC USD Lens *Nikon would fit in it ? The Tamron SP 15-30mm f/2.8 Di VC USD Lens would fit in the Ruggard Lens Case 6.0 x 4.5 .